A remastered version of a Korean cult horror hit. This month's PC Gamer Club game is The Coma: Recut. This remastered version of a Korean indie horror hit has 85% positive reviews on Steam, and features a mix of survival and adventure genres. 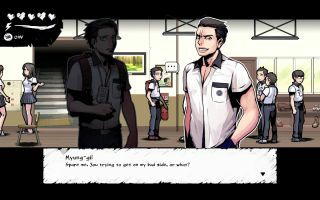 You'll evade a pursuing killer in the hellish corridors of a spooky school, and as suggested in the screenshot above, it has graphic adventure elements, too. These keys come courtesy of retailer Fanatical and publisher Digerati Digital, and expire on March 14, so be sure to use them before then. Check out the Steam page for more info on the game. This is just one of the benefits for signing up to the PC Gamer Club at the $5 Legendary tier. You can also get exclusive skins featuring the PC Gamer colours in games like Elite Dangerous and Rising Storm 2: Vietnam, our long-running monthly magazine sent to your digital device, ad-free access to the website and more. It's a way for you to extend your relationship with us, and get more from PC Gamer. We'll send this key out to members until mid-March.